Just stroking animals is proven to have a calming effect on people. 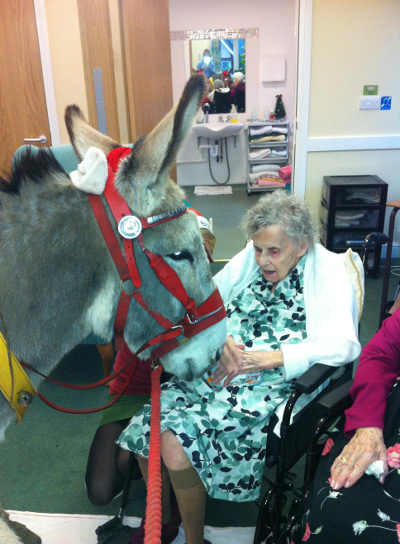 Our donkeys are trained to go inside care homes and can even go into individual bedrooms, right up to bedridden residents’ beds, so that everyone can meet and benefit from them. 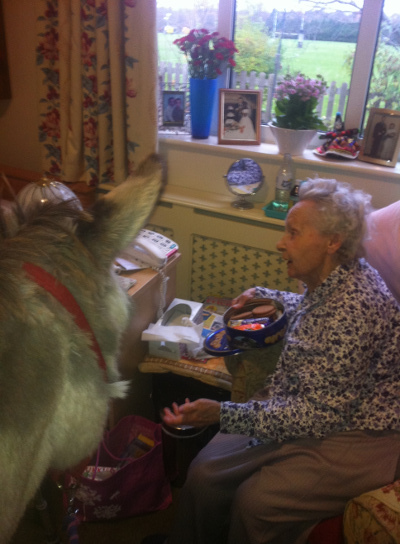 Research psychologist June McNicholas conducted a study into bringing animals into care homes and concluded: "The cuddle factor is important; older people are often only touched in an impersonal way for care purposes so affection from an animal is valuable. It also helps them socially interact with staff and residents." We fit the donkeys with bells when they go into homes and this often stirs up old memories of donkey rides on the beach and allows residents to reminisce. 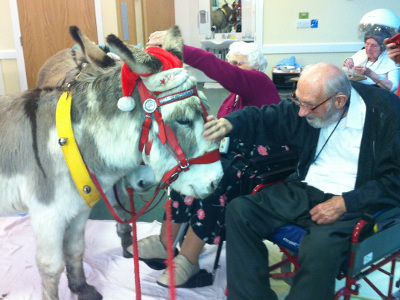 Some residents may have kept horses and donkeys in their younger years and it is lovely for them to stroke the donkeys and chat about old memories. 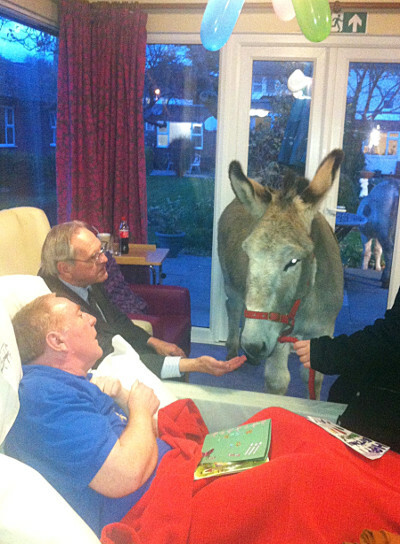 The care homes we visit often encourage residents to invite family and friends to the donkey days. When children come along, we can finish the visit by providing donkey rides out in the garden. If there is limited time or space, children can simply sit on the donkeys in the home itself. We are open to ideas and will do our best to accommodate individual homes’ needs and wishes. The donkeys are used to wheelchairs and one or two extra special ones have been trained to go into lifts (providing the lift is large enough) so that they can access all areas of the home. We provide buckets to catch the occasional ‘toilet issue’ and our donkeys are also happy to walk on old sheets to keep carpets clean when required. "It was lovely to meet Dermot and Danny, two wonderfully gentle creatures who were an instant success! They were so well looked after and well-behaved and our residents loved them. Danny went into nearly every bedroom so no one was left out."